A theme prominently seen in BBC reporting of the ongoing wave of terrorism in Israel advances the idea that the roots of the surge in violence are to be found in ‘the occupation’ and Palestinian frustration over the lack of progress in bringing about the creation of a Palestinian state. Of course that theme is by no means new; it has been a feature of BBC reporting since long before the current surge in terror attacks began. But the BBC’s habitual one-dimensional portrayal of the ‘peace process’ as something dependent on one party to the conflict alone means that its audiences remain severely under-informed with regard to the role played by Palestinian leaders and internal Palestinian politics (another subject consistently under-reported by the BBC) in the failure to reach a negotiated end to the conflict. In a 2014 article titled “Palestine Needs Better Friends“, the WSJ’s David Feith examined the dynamics behind representations of the conflict of the kind seen in BBC content. Such Western enablers emphasize many of the genuine tragedies of Palestinian life, but they elide whatever facts contradict their pro-Palestinian articles of faith. They insist that Israel won’t compromise and a powerful Israel lobby steers U.S. policy, overlooking that Palestinian leaders rejected Israeli offers of statehood in 2000 and 2008. Their idea of progressivism means admiring the Palestinian “resistance”—and remaining silent about the illiberal horrors facing Palestinian women, religious minorities, gays and political dissidents. The October 26th edition of the BBC World Service radio programme ‘Newsday’ included an interview with former US Middle East envoy Dennis Ross. Readers can listen to that item here from 18:02 and a version of it was also promoted separately on Twitter, using an image which does not match its caption’s claim that it is a photograph of Dennis Ross. 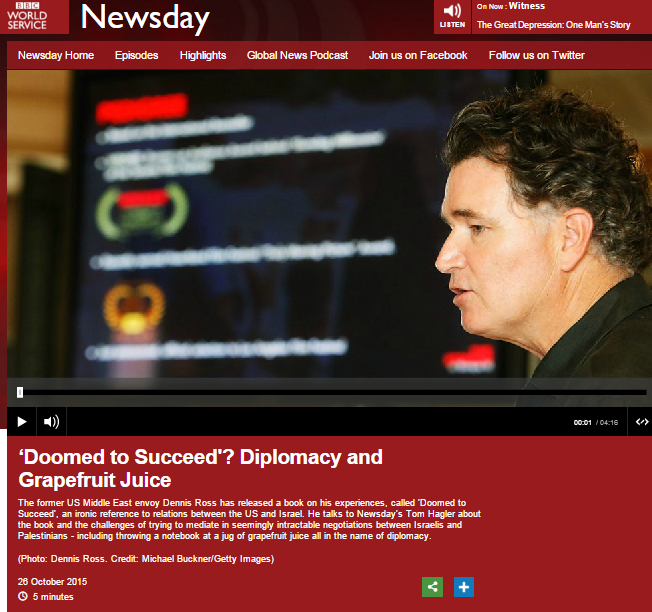 “Newsday’s Tom Hagler asked him if he had any optimism for a success story at the moment, with the background of the stabbings going on now”. However, if listeners were expecting to hear analysis and information which would enhance their understanding of an issue which the BBC has repeatedly cited over the past few weeks as a factor driving the current wave of terror in Israel, they would have come away disappointed. Although Ross provided some interesting anecdotes and insight into his negotiations with Yasser Arafat, unfortunately the brief item did little to counter the chronic deficit of information suffered by BBC audiences on the topic of why negotiations have repeatedly failed or to provide them with a view of Ross’ broader approach to the issue. That wasted opportunity gives all the more reason to expect BBC promotion of the selectively framed theme of ‘Palestinian frustration’ as a cause for terrorism to continue.